This post may contain affiliate posts. Sunshine loves working in the kitchen, whether it be a pretend one or a real one. It wasn't my intention to create a second unit for her this month, but she became bored with her St. Patrick's Day Tot activities, making no progress, and so I felt it time to change. The activities have turned out really cute. I'm super excited. Hopefully she enjoys them. I'm finding she's the hardest kiddo to please out of the four. Sunshine has not been a bit interested in letters, but that doesn't mean I'm going to stop introducing them. I decided to focus on the letter C this week. She will color the C in the picture with whatever color she chooses. Sunshine loves to color. Source: I created this activity as part of my In the Kitchen Tot Printable Pack 1. For your free copy, click on the link located at the bottom of this post. Sunshine still struggles with identifying her utensils and other place settings correctly. I thought using them as vocabulary words for the week, with manipulatives, would be a lot of fun for her. If she shows interest, I can teach her how to set the table. Source: I created the cards for this activity as part of my In the Kitchen Tot Printable Pack 1. For your free copy, click on the link located at the bottom of this post. I'm having no luck with our number activities yet. This week I decided to try a different method. Sunshine will practice making a pizza with four slices. There are four of each item, including plates. I'm hoping as we pretend play, we can practice counting to four several times. I've been inspired by all of the rainbow activities I've seen in the blog world lately. Sunshine is fabulous at sorting items. She may not understand the concept of colors, or be able to identify them, but she can always put them in the right piles when sorting them. I've created six color cards with corresponding colored food cards. Sunshine will sort the foods correctly while identifying the foods by name in the process. It is my hope to purchase most of the food items on the cards. Each day we'll choose a different color of foods to taste test. My apologies for the list of blue foods being so small. I could not find pictures of any others that i could make available to my readers. As I was researching this activity I came to realize that the color of some foods is debatable. If you find a food that you prefer to put with another color, do not hesitate to do so. I've never seen Sunshine pay much attention to smell. I don't know if she's hypo or hyper-sensitive to it. Since we're working in the kitchen this week, I thought it would be a perfect time to introduce scents. I didn't want to overwhelm her, so I only chose four. Hopefully she enjoys it. I've never used tongs with Sunshine before. Now that I have some that are just her size, I thought I'd give it a try. She loves putting items in and out of containers (it's quite the obsession). I'm hoping she'll show interest in the activity. Sunshine also struggles with hand and finger muscle and coordination. Perhaps this activity will help her develop new strength. Who can resist fun little reusable fruit ice cubes? I'm guessing this will be Sunshine's favorite activity. If not it will be a close second. Sunshine can use the materials provided to pour, stir, cook, and transfer. What's not to love about all of this? Sunshine will practice scooping, dumping, pouring, etc. with the measuring cups, spoons, and pasta. If she shows interest, I'll introduce the concepts of big and little, etc. If not, that's okay too. I'm really excited to introduce Sunshine to her new activities. There's no doubt in my mind that she'll enjoy them. 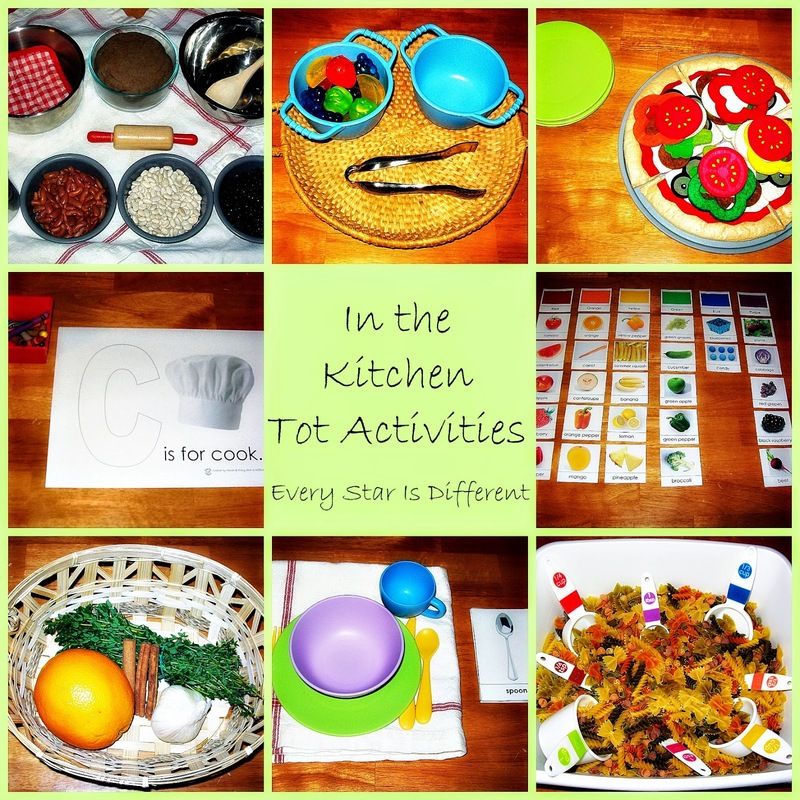 For those interested in the In the Kitchen Tot School Printable Pack 1, click on the link below. Thank you for stopping by! If you haven't already, don't forget to join Every Star Is Different on facebook and/or start following the blog. The rainbow of colors printables looks great! Love LOVE LOOOVVVEE this! I will definitely be using these ideas and printable with my lil cook! Thanks so much!! What a cute unit! I love all your great ideas! Since we are part of the way through our own particular tot school year (we begin with the schedule year), we have found that there are some toys, books, and supplies that we utilize more than others. While a number of the tot school supplies are family unit merchandise, there are some little child particular toys that we certainly utilize and adore more than the rest, making this an extraordinary point! Most cherished and utilized tot school supplie I ALterNATIVE adapting Really this post is valuable for us.